Soft enough to bend in many shapes for many kinds of strainers and pipes, great for kitchen sink, washbasin,bathroom toilets & floor drains,bathtub drain, bathtubs,showers, and all possible sinks etc. We offer 3 types of high quality drainage snakes, reasonable prices and in a variety of sizes, you can dredge your kitchen, bathroom and toilet. The spring design, faster and efficient remove hair or other obstructions. Creative clip design,pick up hair, blockages, and retrieves your lost earrings, rings, or other items. 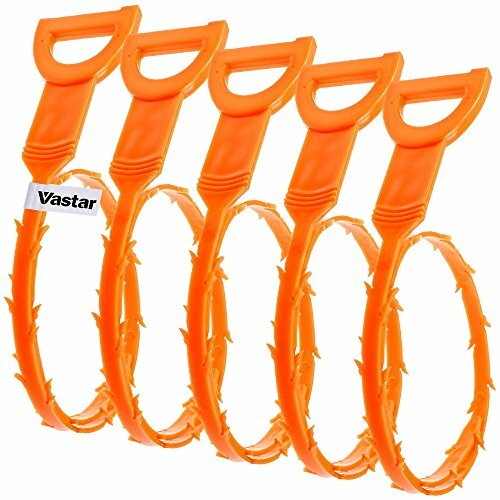 Multi-tooth design for quick and easy removal of obstructions or blocked pipes. Select the appropriate size of the drain snake into the pipeline, gentle strength, slow speed, put it into the appropriate position and gently rotate, then slowly remove the drain snake, repeat it several times until it is cleaned. Function Cleaning blocked drain, hard-to-reach sink pipes. Material Stainless steel and PP plastics. 1*Stainless steel drain snake with blue handle. 1*Stainless steel drain snake with red handle. 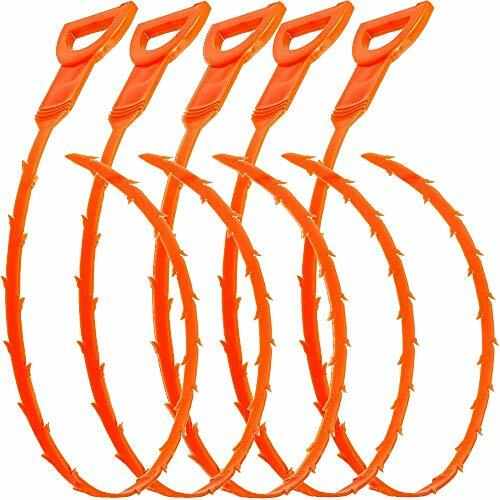 3*Plastic drain snake with multi-teeth. The plastic drain snake's teeth are a bit sharp, please pay attention to protect the hand. Please forgive for the slightest error in the size of the product. If you have any questions, please feel free to contact us and we will resolve it within 24 hours. UNIQUE COMBINATIONS: 5 pieces, 3 styles, multiple sizes for any use, suitable for a variety of pipelines. MULTIFUNCTION: Suitable for kitchen sink, toilets, washbasin, bathtubs, floor drains, easy to operate, help you clean drain, handle blockages. ENVIRONMENTAL: Stainless steel and PP plastics are safe and durable, recyclable, good flexibility, more effective in cleaning clogged drain. Abandon harmful chemicals. IMPROVED LENGHTH: 40in, 24in, 20.1in, 3 sizes are available for you to be more flexible and deep in pipeline cleaning. WATING FOR YOU IN ANY TIME: We consider the different pipes of more customers at home, make our products more diversified, and adapt to each guest as much as possible. After purchasing, you don't know how to use it, or you want to return it, please feel free to contact us. We will help you as soon as possible. 1 x Glove Note:The gloves are sent in random color. 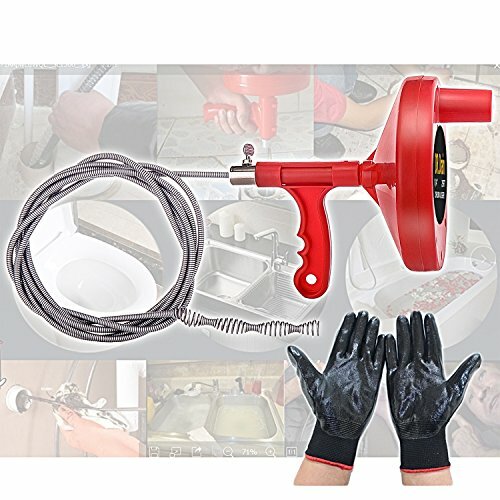 **Suitable for plumbing snake,sewer,bathtub/bathroom/stall-shower drain, kitchen sink, downspouts, central vacuums cleaning etc, which can be great plumbing tools. **High quality ABS plastic, ergonomic body design feature, the operator can easily grip powerful,durable. **Springs can be stored in drum to keep it tidy than conventional drain cleaner. 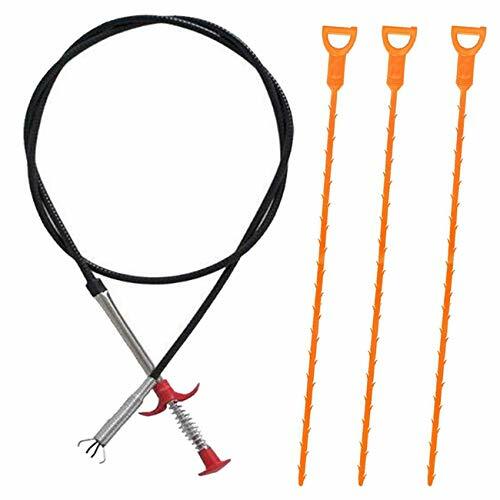 The biggest selling point is the length of the snake up to 25-FT,which is great for doing heavy duty works. 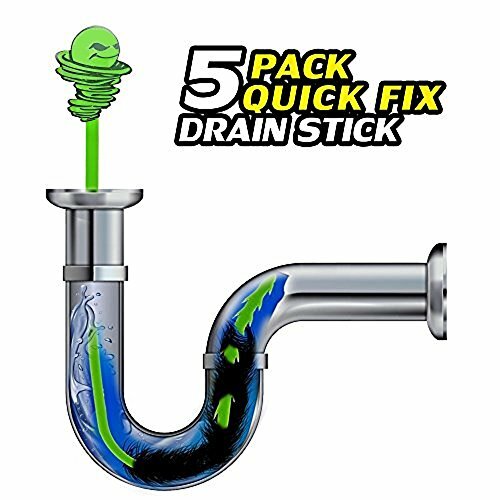 This manual drain snake is suit on kicthen,bathroom,utility sinks, bathtubs and shower Drain Cleaning to resolve Clogged Drains. 5.When you have successfully removed the blockage in the pipeline, you can pull the wire out and clean it thoroughly with water. After the wire is dry, you can coat the wire with oil before pulling the wire into the housing to help keep it from rusting. 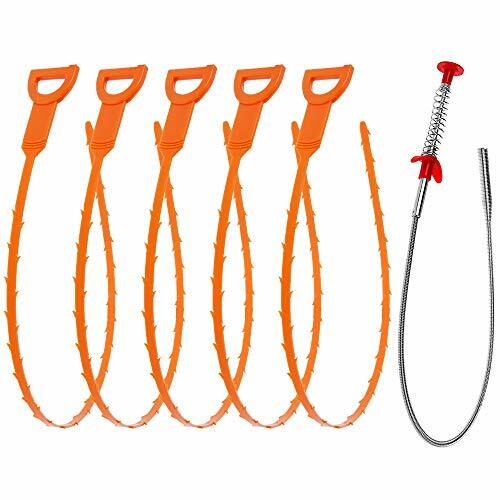 Perfect Solution For Drain Cleaning: Ideal for kitchen, bathroom, utility sinks, bathtubs and shower Drain Cleaning to resolve Slow or Clogged Drains. Easy Handling:Comfortable handle and 16.4ft long long spring cable enough to clean short or long stoppages drains.Unique submachine gun design is very cool and more convenient & effective in removing the blockages. 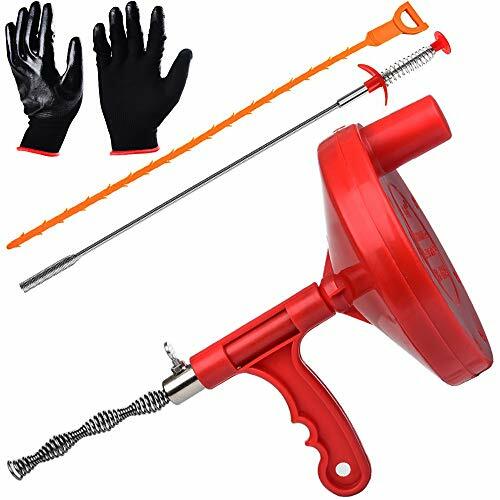 Free Bonus Gloves:Each of Clog Remover Cleaning Tool will come with one Free Bonus Gloves ,which can help you keep your hands clean and safe.Note:The gloves are sent in random color. Made of high quality ABS Pistol grip handle and steel wire cable. Our products have a one-year warranty service. If you receive the product, what problems exist during the use, we unconditionally exchange or refund, please do not hesitate to contact us to find the order and deal with the problem. 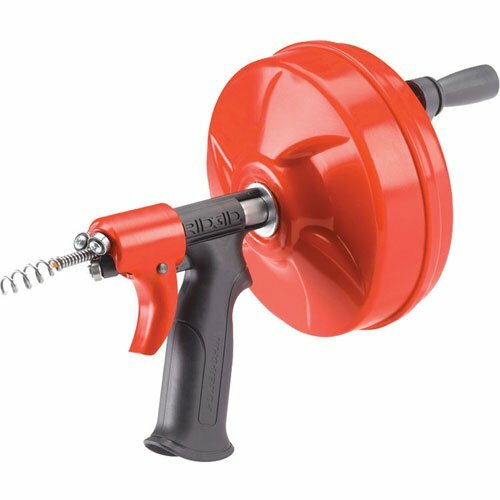 Powered by Tacklife 18-Volt battery, the Tacklife drain auger can be used in pipes from 3/4" - 2" wide. 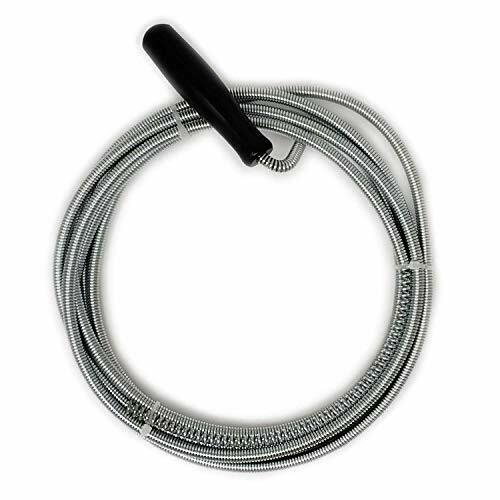 Designed for use in sinks, toilets, and bathtubs, a 25-foot cable that's reinforced to prevent kinking. 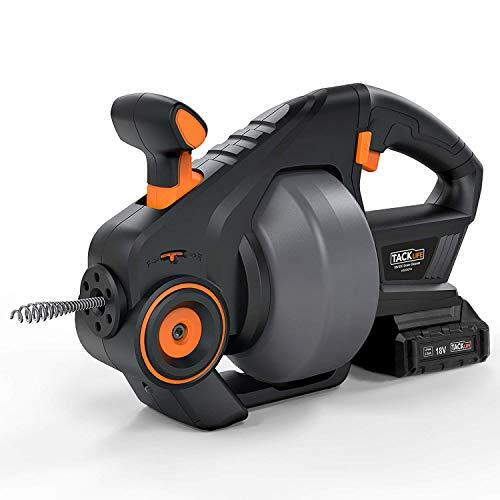 Its variable speed trigger gives you a great range of speeds, Tacklife drain cleaning machines offer a more powerful alternative for homeowners and professional plumbers to clear out clogged drains than traditional snakes. With one 18V battery, you can use our Tacklife PCD04B, PCD06C cordless drill, PMT03B cordless oscillating tool and our other 18V(20V max) tools. This makes sense to join Tacklife 18V(20V max) tool family. 4. After finishing cleaning job, push the operating knob backward to roll up auger automatically. 1. 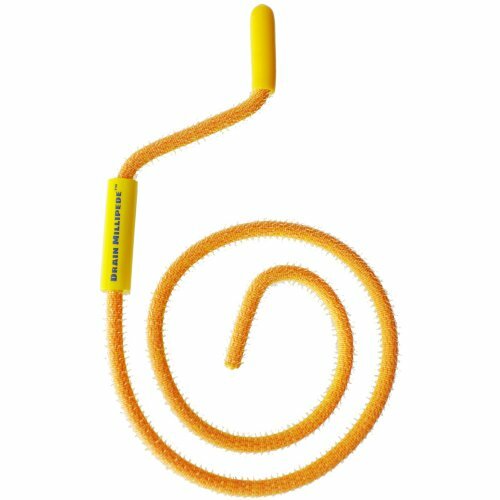 Once your drain is clear, it's a good idea to clean the drum and cable before you put the Tacklife drain auger away as the cable has the potential to be covered with some pretty nasty, smelly, bacteria-laden stuff. 2. When it's clean, take a dry towel (preferably one you're not all that fond of) and dry the cable as you push it back into the drum. 3. 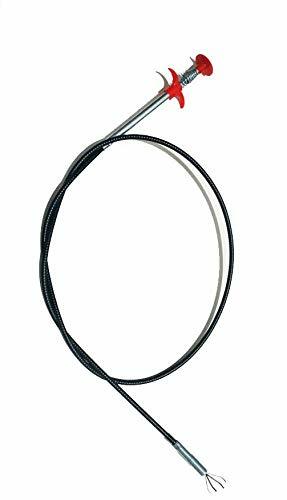 Gently guide the auger into your pipe(especially in toilets), please force it carefully as it may cause damage. Once you've reached a point where it stops, start turning it to clear up a blockage. 4. Please stay the forward & reverse switch in the middle to lock trigger when it's off work. Pipe size cleared: 3/4"- 2"
Lithium Battery Lithium-ion 18V 2.0Ah battery stays powered up for a significant length of time and for use with all DIY and garden tools in the Tacklife 18volt system, More portable and convenient to use than corded tool. Variable-speed Control By applying different forces on the switch to adjust the speed, the speed can up to 560RMP, you can adjust the speed freely to suit different projects. Efficient Work Dredge drains from 3/4 to 2 (19-50mm) in Diameter by 25Ft(7M) steel flexible shaft, which can meet various needs like S and L pipes. Segmented design allows for easier shaft replacing. LED Light Equipped with a LED light at the bottom, improving the brightness of the working environment, convenient for night work. Pls Attention Keep the tool head at a distance at least of 150mm of the pipe opening. If the shaft twisted, pls push the forward & reverse switch or the lever to opposite position. Avoiding over-released flexible shaft, or it will be knotted and cause blockage. Usage method remove the drain cover if needed simply lower the tool into the drain as far as possible slowly remove the drain tool and be amazed at what comes pulls out. Because of Pipelines SPECIALLY designed barbs, the hair and debris get hooked and as you remove the tool, also taking care of the clog. 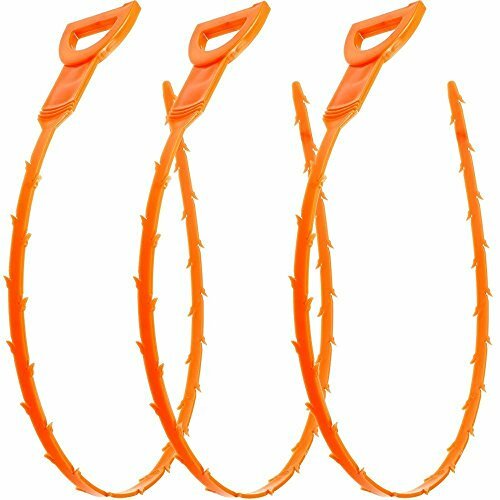 It is a multi-tooth snake drain and catches hair,food and other blockages efficiently. You can easily handle the blockages. No need a highly-paid plumber.And no need to use odorous chemicals. Flexible but strong . It prov5piides guaranteed cleaning for bathtubs sinks in toilets and kitchens which have drain problems.Please protect your eyes when using this product. We promise to replace it free of charge for 150 days. If necessary, please contact us. 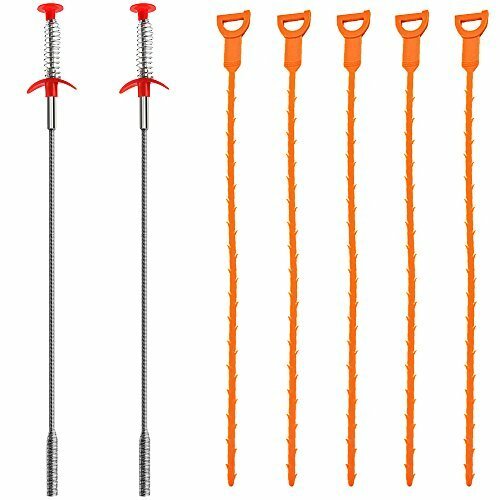 Springy Wound-Steel Cable & Gripper Design: The handle on the top of the pick-up tool was constructed with a sturdy grip for an easier control. 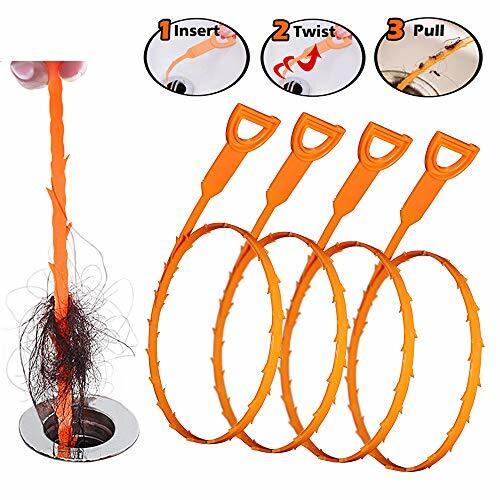 flexible wand has dozens of burrs and hooks that grab & remove hair, food, garbage, and other obstructions. Flexes in narrow angels and channels. 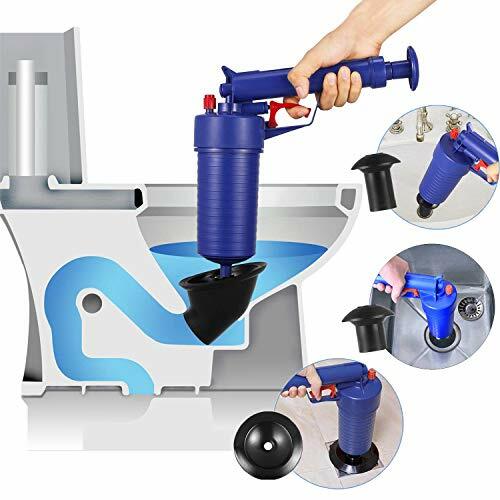 Durability: Drain snake and drain clog remover is made of a heavy duty eco friendly plastic construction to ensure there is no breakage, and maximum flexibility when being used. Clogged drain hair remover is built to last through everyday use. 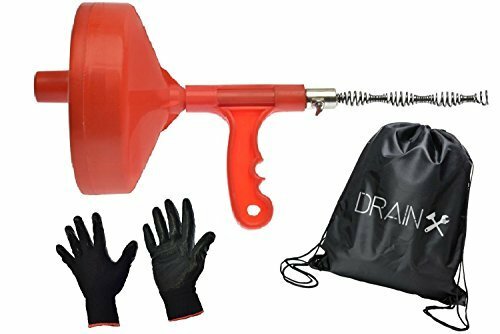 Multi-Function: Drain Clog Remover can use to remove hair, food, garbage and other obstacles with a four claw retractable grip or as a grabber for something under the couch or down a vent. 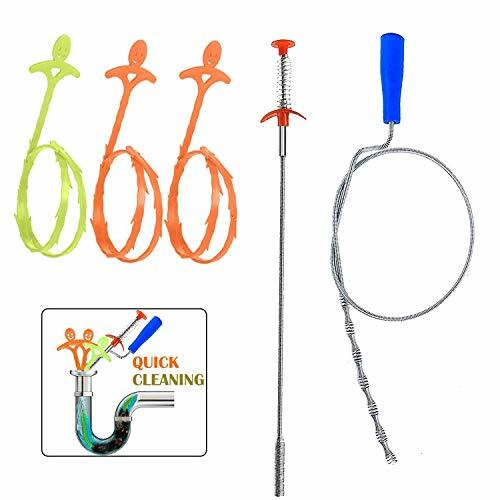 Drain snake are ideal for kitchen, wash basin, clogged drains, sewers, bathroom & utility sinks, tubs and showers clog remover. Usage: suitable use for sewer, bathtub drain, bathroom drain, stall-shower drain, kitchen sink, downspouts, central vacuums etc. You don't have to buy separate one by one.It is the most cost-effective. You don't have to worry about home sewer blocked, they can be reused. This combination is a good helper of household, it is the most cost-effective . You don't have to worry about their work efficiency, our commitment has quality problem, the unconditional return! What do you have in mind? Please contact me ! I will be in the shortest possible time to help you solve the problem! UNIQUE COMBINATIONS: 6 pieces, 3 styles, multiple sizes for any use, suitable for a variety of pipelines. 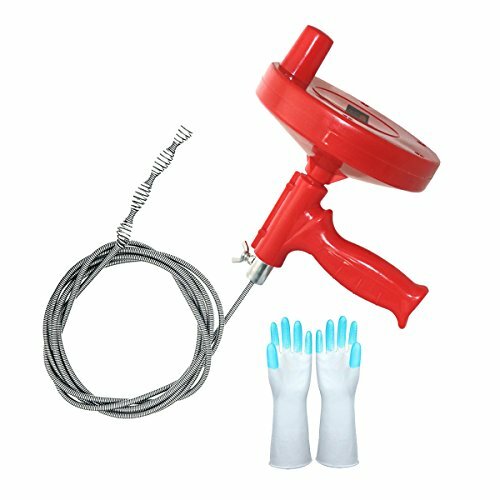 Save money and time, the operation is simple, you will no longer require expensive plumber service affordable sewer cleaning tools, it is your good helper, is 100% lower than toxic chemical cleaning engineering loss more health and safety. Durable and practical, easy to use. Adjustable spring length, can be bent to clean the pipe. Suitable for cleaning kitchen sewer, toilet, bathroom, floor drain, etc. Features: Durable and practical, easy to use. Adjustable spring length, can be bent to clean the pipe. Suitable for cleaning kitchen sewer, toilet, bathroom, floor drain, etc. 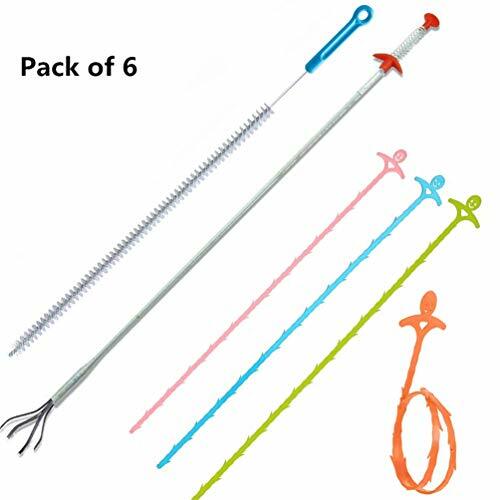 Features a high-quality spring wire for excellent flexibility in tight bends.Simple to use! 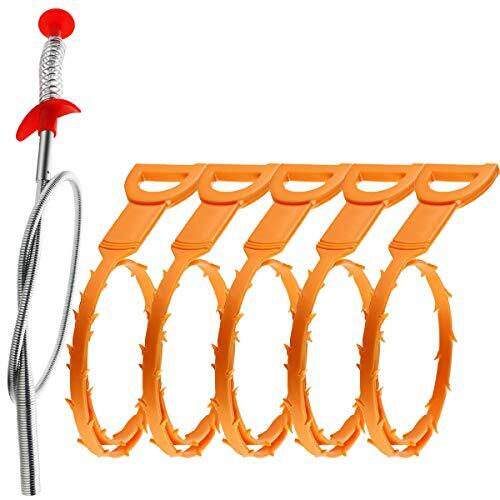 Heavy Duty Spiral Drain Opener is bendable and very flexible allows you to unclog the hard reach areas. Use for cleaning a clogged toilet, sink, bathtub,Remove Hair, Debris and Clogs etc. 1. 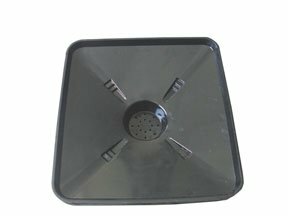 Plug claw part into the sink/drain slowly. 2. Hold and press the red handle at the top of spring, and then the claw will open and grip clog. 4. Clean it with water, air drying, roll it up and then store where children cannot reach. 1. Please keep the product away from children. 2. Be careful when use the drain snake, to avoid being scratched by claw gripper. 3. Any questions you have, please don't hesitate to contact us. We will get back to you within 24 hours. 4. We are committed to Our Customer's Satisfaction. One-Year Warranty and Lifetime Product Service Support. 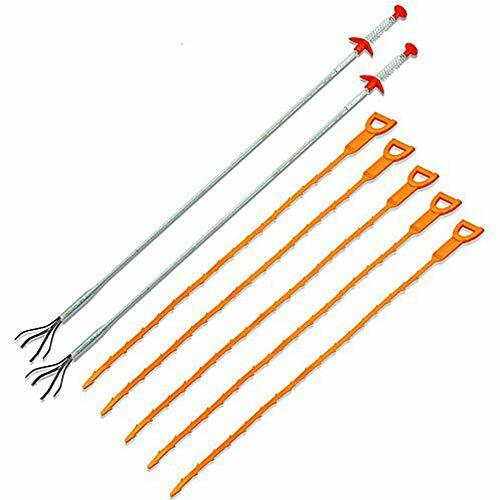 2019 NEW VERSION stainless steel catcher with PATENTED ABS wrapping, suitable for cleaning solid and multiple obstructions in clogging drains during 24''~34'' in length. CLAW GRIPPER&PP HANDLE. 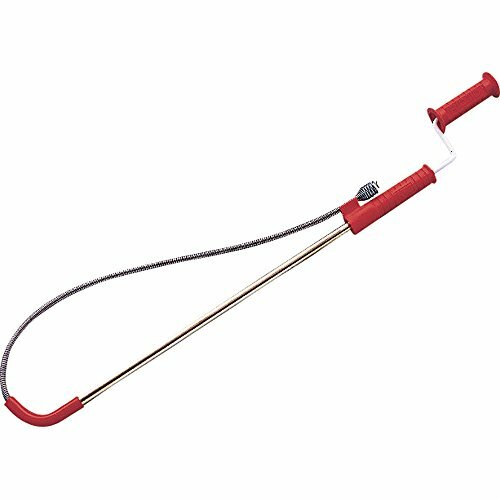 This stainless steel cleaner is 35.4'' in length, smooth PP handle with press button at the end, to control the claw gripper at the other end of the drain snake. WIDE APPLICATION. 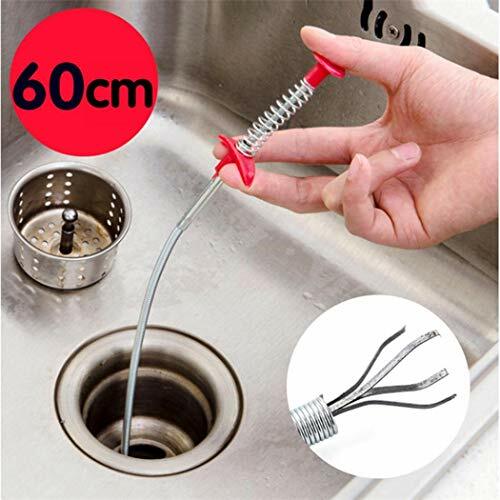 Stainless steel drain snake hair tool can be applied to cleaning various places, such as, bathrooms, kitchen, sinks, tubs,drain, wherever clogs occurred indoor, expecially for clearing hair, food and other blockages in daily life. LESS POLLUTION and LESS EXSPENSE than toxic chemical drain cleaners, and safer, easy operation. ABS wrapping makes it possible the clogs even hair will not wrap on the surface and easier to clean and stock. 1. Please keep in a secure location where children cannot easy to touch. 2.Take care not to hurt yourself when use the drain snake. 3. Any questions you have, please don't hesitate to contact us. We will get you back within 24 hours. 4.We are committed to Our Customer's Satisfaction. One-Year Warranty and Lifetime Product Service Support. 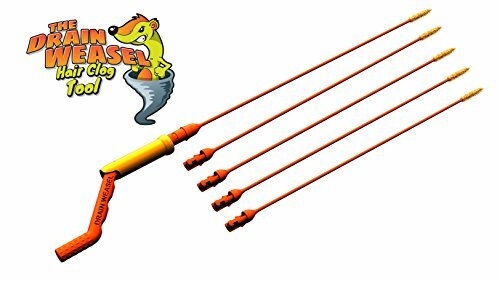 3 pack of flexible plastic plumbing snake drain auger. 2 Length for your choose one time. 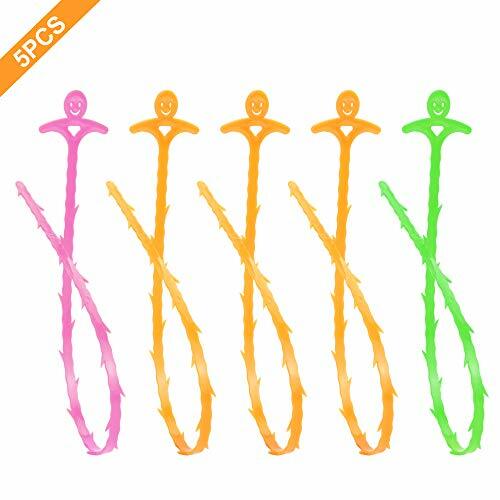 20 and 25.2 flexible barbed wand can easily grad & remove clustered hair, food, garbage and other obstructions easily. Soft enough to bend in many kinds of strainers and pipes, great usable for kitchen, bathroom & utility sinks, bathtubs and showers. Great drain tool for unclogging shower and sink drains, flexes at P-trap where most clogs occurred.